A sad reality today at most academic conferences is that it's fairly common for at least one speaker to not make it due to visa problems. This is not just true because of the USA's reduced welcome to foreigners, it happens in other places as well. This made me wonder if it isn't time to apply some technology to this. Let's face it, a lot of the people giving papers at academic conferences are not exactly dynamic speakers. Some just read their papers without emotion. Because all conferences are now in English, for those whose command of the language is weaker or whose accent is very strong, it can be difficult to understand. Naturally, many people who go to a conference don't go to see the papers, or even just to give one. The real value is in the conversations after the papers, the random hallway conversations and meetings, and the social events. But not for everybody, especially if it's very expensive to travel or difficult due to visas. For these situations, technology has reached a level which might help a bit. For those who can't easily come, playing a recorded video makes more sense, combined with the use of a telepresence robot or "remote speaker station" to allow people to come up and converse with the speaker after the presentation. The robots work pretty well, actually, I have done this several times. They are expensive, but for not too much money one could also make a "remote station" with tools like Skype or Hangout, as long as bandwidth is up to the task. Such a station could consist of a videoconferencing laptop with as many USB headsets on it as necessary, with some software to multiplex them together. More simply, you could just have a collection of laptops or phones joining a group video conference (both Skype and Hangout offer this for free) with each person having a headset for superb audio. 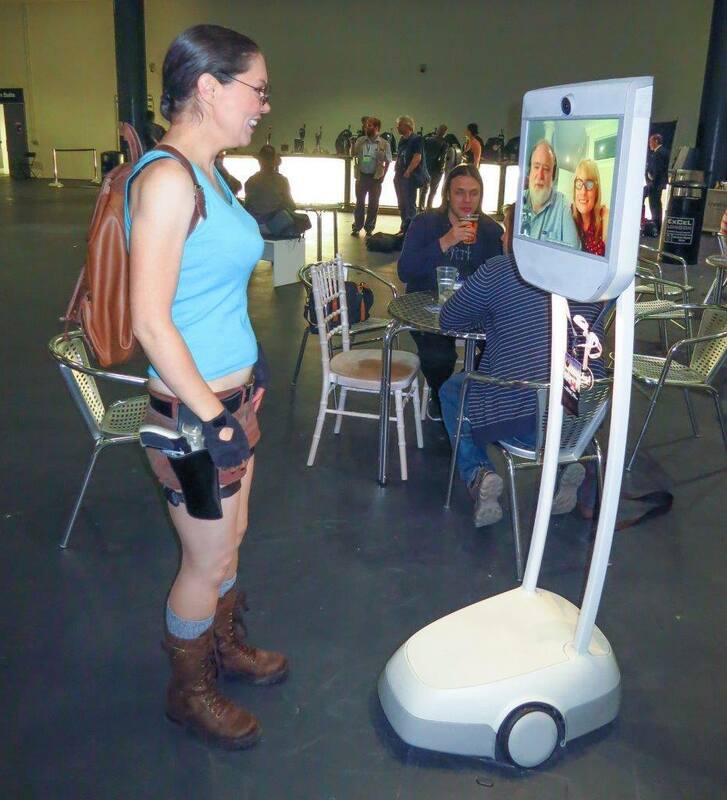 The station approach allows other remote people to also talk to the speaker and others after watching the video. Rather than having the below-average presenter do a live talk over Skype, it is better that they prepare a video. This has a lot of advantages. The big one is that it works even with internet connection problems. To help with this, I propose the creation of a tool that makes it easy to make a video of yourself talking. With this video tool, you would give your talk to the camera. (Paste a cutout of a face over the camera with an eye hole over the lens to make eye contact.) It would of course record slide transitions as well as your video. The tool would then generate a transcript. To help it, you could feed it a copy of the paper. Hopefully, you are not just reading the paper, but the copy will give it clues on unusual words and phrases you are likely to use, to make things more accurate. It would be the speaker's job to then edit the transcript text to make it accurate. Next, or at the same time, the speaker could remove things from the talk, for clarity and for time. It would be impossible to go long on time because you can see the length of the video. Tools could make it easy to clip out, you know, um, uh, verbal ticks. You could even rearrange sections of the talk if you wanted. Re-recording would be an option but that's more work than I expect to put speakers to. With tight binding between text and audio, editing the text would mean editing the video in a decent way. Then the video would play, with subtitles, to help get around problems with difference in accents at international conferences. Those watching on their own would also have the option to speed up or slow down play, or skip to the "good parts." Frankly, this might be a good idea even if the speaker is present in the room -- give a video that's gotten some cleanup, and be there in person for the Q&A. Of course, those who wished to could take more effort for fancy video production, but the goal is to make that not necessary. Those who just wanted to see a few papers and talk to a few presenters might decide they no longer need to attend. If the presentations are all available as video, then you can watch them at leisure, and then join the post-talk scrum. Speakers could, after talking to the local crowd, go to the remote station and use it in the other direction. They could also do it before their talk, since the remote folks can get an advance look at the video. It is harder to do just one post-talk discussion because with the speaker and audience there in person, they won't sacrifice that immediacy for those who did not wish to come. I attended a small academic conference last year. There were at least two speakers that were not able to attend dues to visa issues, and delivered their presentations via recording. One was quite dull, just reading their paper, doing nothing to really add to the material. The other was probably the best talk of the conference. The presenter took care to use a good quality mic, and edited the presentation, adding animation to demonstrate complex topics, and to keep within the time allotted. The only downside was that the hotel wifi was not able to provide a live feed to talk with the presenter after the session, but the session moderator was familiar with the work, which made up for it. The technology is there for a live video feed, but perhaps a little cost prohibitive for small conferences. My guess is we need another 4 years to get a bit cheaper, and for the organizers to plan ahead to rent the necessary equipment. You tip about putting a face cutout over the camera is great. Most people do not have a good understanding of camera presence. I think this is a great alternative when issues popup, but I hope it does not become the norm. Like you said, the real work happens between the presentations, in person. I love when two people are talking, realize they have the same problem, and are able to swap notes. Yes, the idea of resolving it with tech does happen. What I am suggesting is we get used to the idea that it happens, and have good tech at the ready to do the best we can in that situation. Aside from having a conversation station or telepresence robot, or tools to make it easier to improve the quality of a recorded video, another simple step is not booking a hotel without a suitable internet connection (non-wifi) for the after discussion. You could even allow people to ask questions during the playback of a recorded video, if time allows. Recorded video is best because it can be improved and will always have excellent video quality, but the speaker should be "there" as well, which means a local moderator could pause the video for a question. And if the internet quality is good, the speaker could decide to be live. Having given several talks via Skype, I will say that one thing people often miss is that it's sadly too much like giving the talk to a blank wall. The people at the other side rarely put in the effort necessary for two-way telepresence. The audience members are just blobs in the video so you can't see their reactions well. The sound of the audience is often muted by the echo-canceler or the AV team to improve the audio from me, so I can't hear their reactions. I have never seen anybody do it, but the right way to do this would be for the speaker to wear earbuds (so that audio coming back can be played without fear of it getting picked up by the speaker's microphone) and for the audience to all wear them too, or to at least have a mic at every table. That is actually doable because everybody in the room is already carrying a digital mic connected to the wifi, it is called their phone.